It can’t be killed! The legendary zombie post is back and updated with a new tip! 7. Looking to escape? Rope climb baby! Ever see zombies climb rope? Me either… (Steve Musolino Jr. via twitter @stefanomjr). 6. Zombie Disposal! Once the undead have been re-killed you’ve got to do something with the bodies. Finally, all of that virtual shoveling will pay off! (Ian Mehr via twitter @IanMehr). 5. According to Zombieland, Zombie rule #1 is cardio! No matter what your 400m sprint time, you can definitely outrun the zombie horde! (Jeff Frost – @Frosty996 and Jaimie B – @Supervixen13 via twitter ). 4. Get your double unders on to turn your rope into a high speed zombie slicing machine! They said CrossFit wasn’t a cult! 3. Truth be told most of those zombies are just skin and bones so you should be able to scoop them up and wall ball their asses to bits! 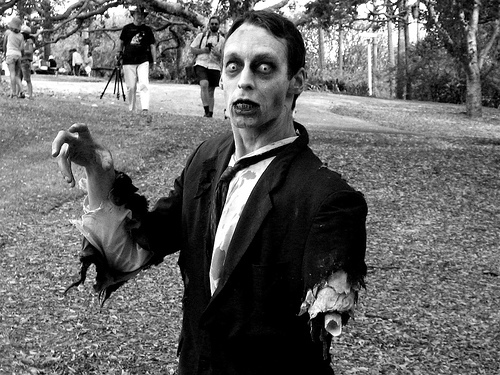 Yo zombie! What’s your Fran time? The great sock pic is from Carrots ‘n’ Cake blog. 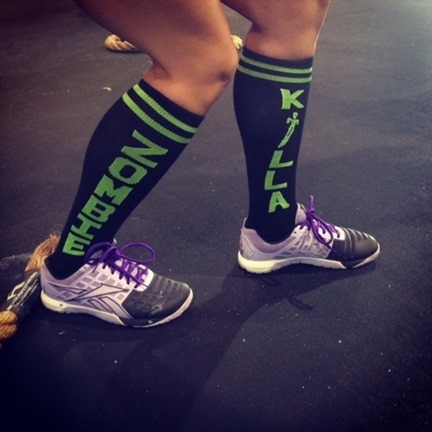 You can get your own pair of zombie socks at SoxBox.